Leading Australian engineering firm ESS Engineering Services transformed a design challenge at a major ship loading terminal into an opportunity to improve the maintenance process for the client while increasing worker safety. 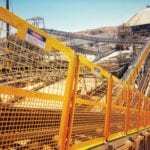 Conveyor systems in all industries, including mining, ship loading and power stations, require maintenance to avoid critical disruption to operations. Performing conveyor roller change outs is an important aspect of conveyor system maintenance with conventional practices requiring workers to work at height using scaffolding and fall arrest equipment. 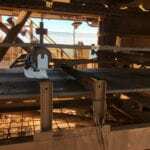 Such processes are not only labour- and time-intensive, but also have worker safety implications with the maintenance crew required to change the rollers at height in difficult conditions. Hazard control measures required in traditional roller change-outs not only increase time and cost of basic maintenance but also involve a larger crew size of up to three workers to change the rollers as well as scaffolders to erect and dismantle work platforms. ESS’ client sought to upgrade over 1000 idler frames on the conveyor system at the ship loading terminal to simplify maintenance for the crews responsible for roller change-outs. 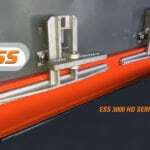 The ESS product development team worked with the client to develop an updated sliding idler system that would eliminate the hassle and engineer out the existing hazards from roller replacement. Key concerns that needed to be addressed during the idler frame design process included safety issues related to working at height in awkward positions, manual handling, pinch points and risk of injury; access constraints in hard-to-reach areas; and difficulties in roller removal from idler frames. As the exclusive licensed manufacturer of Martin Engineering USA, the original developers of TRAC Mount Idlers, ESS was equipped to bring its experience and expertise to the design table. For the ship loading terminal upgrade, ESS refined the original Martin Engineering design for idler frames, retaining the successful core principles while increasing the durability and safety aspects. ESS designed and manufactured a new idler frame that simplifies roller change-outs on any elevated conveyor or in restricted access areas. The upgraded design is recommended for use in any materials handling facility from underground mines to ship-loading operations over water. 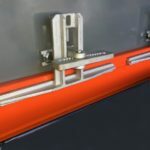 The new ESS Quick Change Trac Mount (QCTM) retractable idler frame is designed to smoothly slide out from the conveyor along a custom-built track and easily disengage the rollers. Several design features address the safety concerns related to roller change-outs in conveyor maintenance. For instance, the wider footprint of the new QCTM retractable idler frames ensures operational stability on the conveyor. The new ESS frame has a fully enclosed self-supporting design ensuring stability when sliding out. A stopper pin prevents the frame from sliding all the way out from its mounting. QCTM idler frames are manufactured in both galvanised steel and stainless steel; however ESS recommends stainless steel for better performance and long-lasting service, especially in harsh environments. QCTM frames are also very rigid in service with no movement or vibration. The frame’s lightweight design allows the worker to safely slide it all the way off its track without requiring any lifting device. Workers can easily access the rollers from the walkways without entering the belt or requiring any scaffolding or fall arrest equipment to carry out roller change-outs. Upgrading to QCTM retractable idler frames is delivering huge savings to clients in maintenance time and man-hour requirement. A job that previously required up to three workers and anywhere from an hour to an entire shift to change the rollers on a single idler frame can now be performed by a single worker in less than 10 minutes. The significant maintenance cost savings not only ensure quick payback for the upgrade investment but also maximise profitability for the company. By building safety into the design, ESS has minimised the risks of roller change-outs and engineered out the major hazards encountered during conveyor roller maintenance. The QCTM retractable idler frame is just another example of ESS’ collaborative design process with its development team engaging proactively with the client to design solutions that respond to the functional, operational and safety challenges on site.